Srinagar: Hurriyat Conference (G) chairman, Syed Ali Geelani has said that it was if trouble is only in three districts then it is a golden opportunity for India to ask the people to decide their fate. 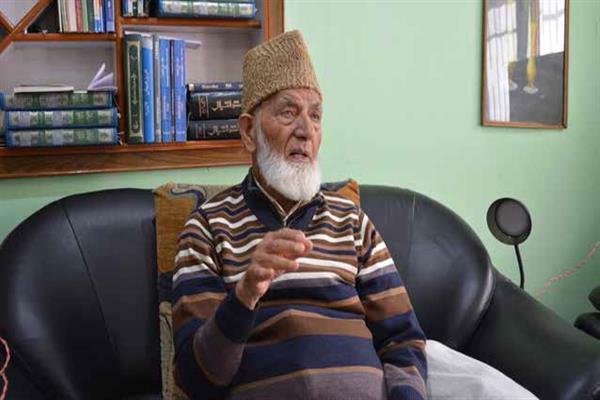 “And they are sure to win and will get rid of the tag and blame of oppressor and aggressor which may pave for their way to new international and global heights,” Geelani said in a statement. During an election rally, Prime Minister Modi has said that Kashmir problem was just concentrated to three districts and time has come to change the narrative. He said that Kashmir is a globally accepted dispute with both countries, India and Pakistan, being signatory and unrealistic and undemocratic media voicing by Indian rulers can in no way change the dynamics of this issue. Geelani said that these baseless thunders may lure the majority vote bank and Saffron brigade may once again succeed to befool its people, but issue like Kashmir need a pragmatic and statesman like dealing which at least in Delhi rulers is hard to find. Hurriyat (G) chairman said that people claiming a vast majority and being a major political party should at least issue the statements close to the historical facts and figures, which can never get diluted or changed by the repeated and arrogant narratives like “Atoot Ang”. “Despite millions of armed forces, supported and helped by a vast and notorious investigative sniffing, Kashmir is still boiling and the heat is felt not only in Kashmir, but whole of India. Daily deaths and destruction has led to the nuclear confrontation in waiting and had power a solution to any problem than 71 years is more than enough to solve any issue, but present scenario, speaks volumes against it,” he stated.